People living near waterways can avoid the damaging effects of flooding by building embankments, which can be made safer using bank protection structures. However, factors such as soil pressure, water level fluctuation, and groundwater seepage can cause bank protection structures to deform and eventually collapse. To better understand this issue, researchers modeled a bank protection structure located within the Yangtze River in China, enabling them to predict the structure’s displacement and deformation. 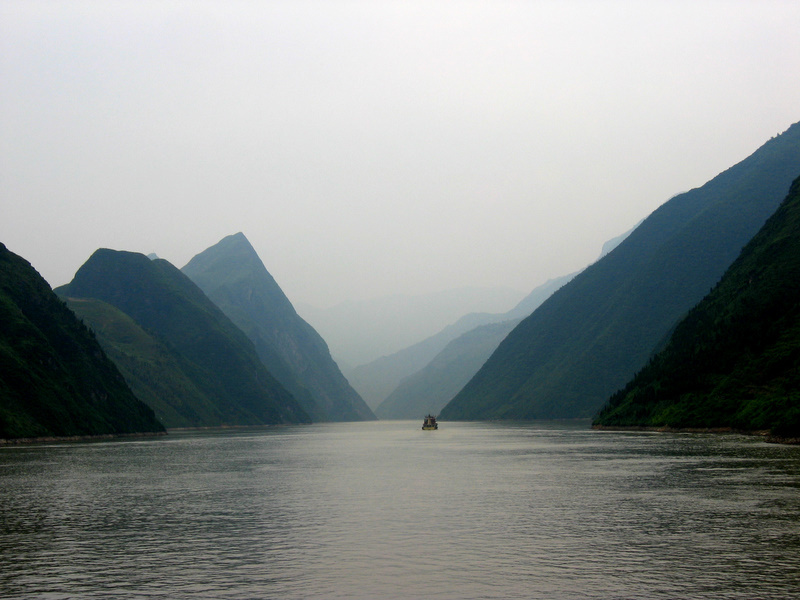 Stretching across 6300 km, the Yangtze River is the world’s third longest river and the longest river in Asia. Throughout history, humans have relied on this river for irrigation, transportation, and many other purposes. Today, the Yangtze River is one of the busiest waterways in the world, with multiple major cities settled on its banks. The Yangtze River. Image by Perfect Zero — Own work. Licensed under CC BY 2.0, via Flickr Creative Commons. To protect these cities and their inhabitants from issues like flooding, we can build embankments and use bank protection structures to maintain their safety. 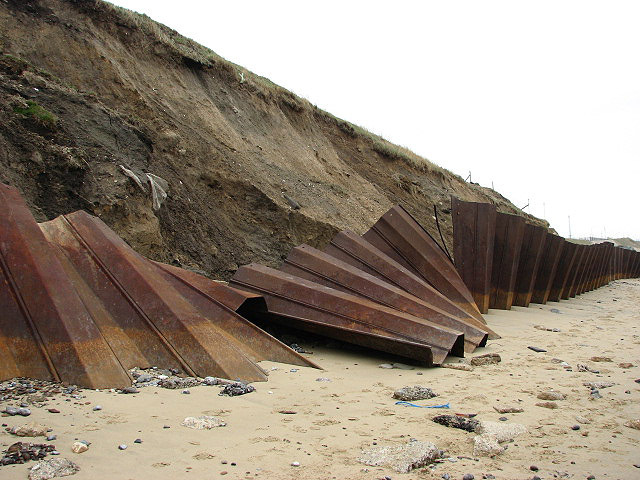 Bank protection structures commonly use steel sheet piles to support embankments. These structures have applications in waterway engineering, wharf construction, and cofferdam excavation. A (partially disrupted) steel sheet piling. Image by Evelyn Simak — Own work. Licensed under CC BY-SA 2.0, via Wikimedia Commons. Problems can arise when these structures deform and eventually collapse due to issues like fluctuating river levels. 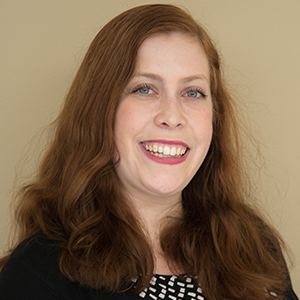 To avoid this and maintain the safety of bank protection structures, engineers can use multiphysics modeling to predict the deformation and its causes. With this in mind, a research team from the School of Earth Science and Engineering at Hohai University used the COMSOL Multiphysics® software to analyze the deformation of a bank protection structure in the Nanjing section of the Yangtze riverbank. A bank protection structure’s deformation is affected by soil pressure from excavating riverways as well as changes in the hydrostatic (or water) pressure due to the seasonal fluctuations of the river’s water level. These fluctuations can in turn cause changes in the soil seepage field and groundwater level, affecting the soil’s mechanical properties. Left: The bank protection structure and surrounding environment. Right: The grid of the resulting model. Images by R. Hu and Y. Xing and taken from their COMSOL Conference 2016 Munich paper. To account for these variables when predicting deformation, the researchers created a 2D water-soil model based on the Deep Excavation model in the Application Gallery and coupled it to Darcy’s law. The model analyzes a section vertical to the bank protection structure’s steel sheet piles, shown in the left image above. The soil around the piles has three layers, based on the soil’s physical-mechanical properties. The researchers also used an ideal elastoplastic model and a Drucker-Prager yield criterion. The bank protection structure. Image by R. Hu and Y. Xing and taken from their COMSOL Conference 2016 Munich poster. The researchers’ model uses data gathered from monitoring the water level of the Yangtze River over 120 days as well as from four displacement monitoring points. 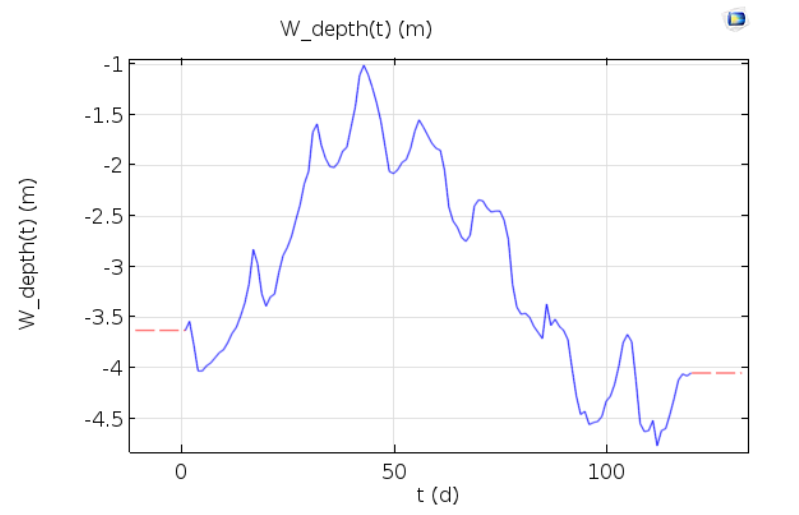 The river’s water level fluctuations in the simulation are based on this measured data. Left: The monitoring data for water level fluctuations in the Yangtze River. Right: The horizontal displacement of four monitoring points. Images by R. Hu and Y. Xing and taken from their COMSOL Conference 2016 Munich paper. Calculating the embankment’s groundwater seepage field by accounting for water level fluctuation or change in river level. Using a strength reduction method to adjust the soil shear strength parameters by the groundwater table. 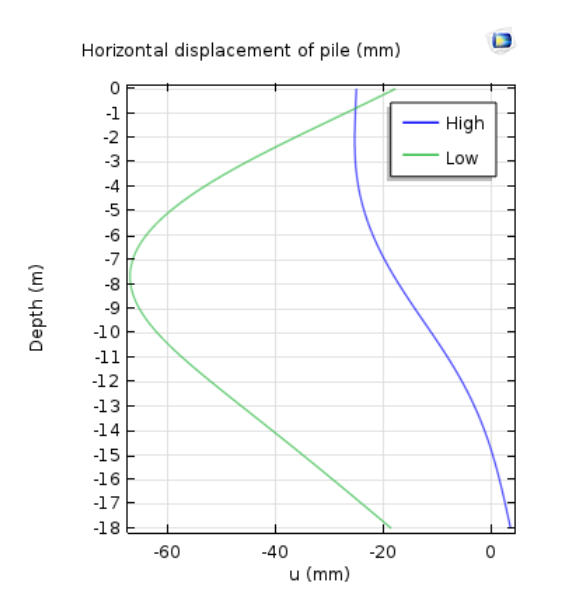 Determining deformation with the modified deep excavation model. Let’s take a look at the results from this simulation. The results show that while deformation is stable during early excavation, afterwards it is affected mostly by water level fluctuation. For example, let’s look at a few plots showing how a bank protection structure is affected by a water level of -6 m.
At this level, a water head difference on the side of the pile results in a groundwater discharge and change in groundwater level. As seen below, the total pressure varies under the water level and there is a relatively large structural displacement in the excavation’s middle part under the hydrostatic and soil pressure. The maximum observed displacement is 60 mm. Left: The total pressure and seepage fields, with the white line representing the groundwater level. Right: The steel sheet pile’s displacement. Images by R. Hu and Y. Xing and taken from their COMSOL Conference 2016 Munich paper. As shown below, the plastic deformation is mostly located in the soil’s first layer below the water level depth. The structure’s plastic deformation when the river’s water level is at -6 m. Image by R. Hu and Y. Xing and taken from their COMSOL Conference 2016 Munich paper. 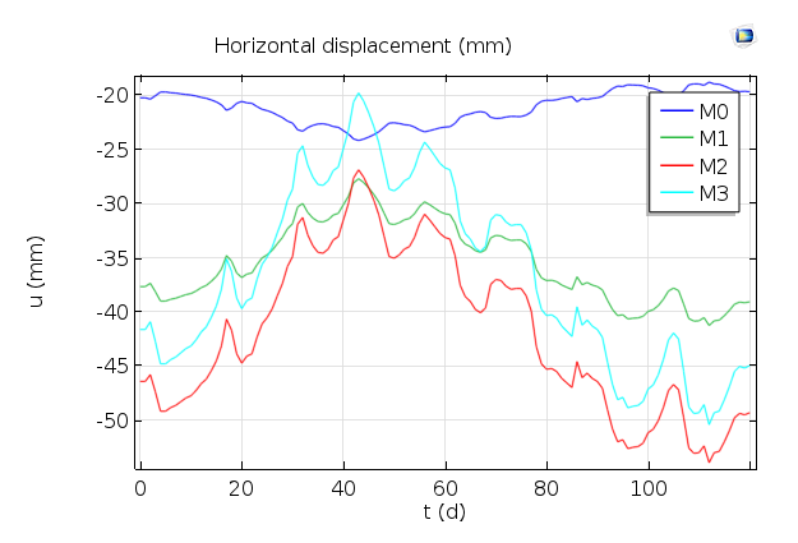 When using the monitoring data to find the model’s horizontal deformation, the researchers found that the structure’s main deformation is displacement and that there is a good consistency in the variation of horizontal displacements and water level fluctuations. This displacement is relatively small because of the resistance of the struts on top of the pile. As a final point of interest, the team explored how extreme water level instances affect deformations. To achieve this, they used water-level monitoring data to find the Yangtze River’s highest (-0.3 m) and lowest (-8.4 m) water levels in the past 10 years. The extremely high water level case has a small plastic area and its plastic deformation is confined to the soil’s first level, while the extremely low water level case has a larger plastic area that stretches into the third soil layer. 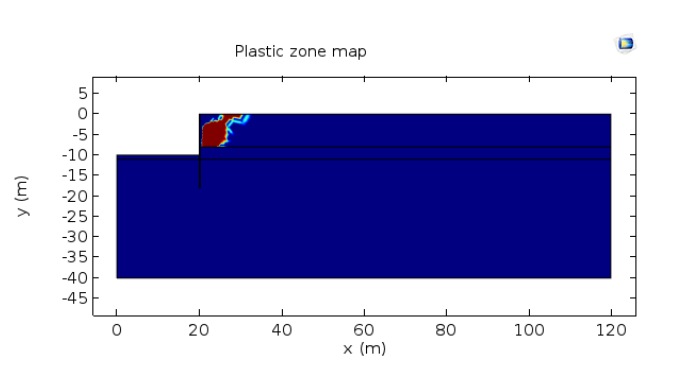 The plastic zone distribution in the extremely high water level case (left) and extremely low water level case (right). Images by R. Hu and Y. Xing and taken from their COMSOL Conference 2016 Munich paper. The maximum horizontal displacement is 25.1 mm for the high water level case and 65 mm for the low water level case. This latter value exceeds the project’s warning value of 56 mm. Further, the maximum shear stress for the low water level case is 18.5 MPa. This is lower than the steel sheet pile’s yield limit of 335 MPa. As a result, there is a chance of excessive structural deformation and a higher risk of the structure collapsing when the water level is extremely low. This must be addressed when designing bank protection structures. 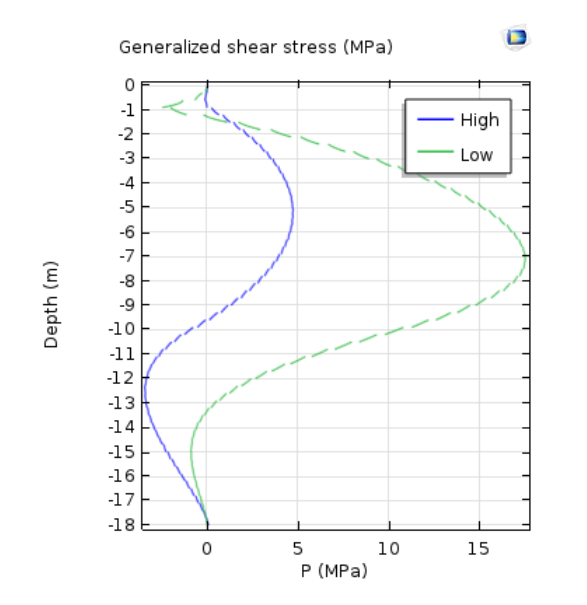 The steel sheet pile’s horizontal displacement (left) and generalized shear stress (right) for both the extremely high and low water level cases. Images by R. Hu and Y. Xing and taken from their COMSOL Conference 2016 Munich paper. With their multiphysics model, the researchers successfully confirmed that fluctuating river levels affect the lateral displacement of the steel sheet piles in a bank protection structure and that the plastic zone distribution is related to groundwater level depth. Moving forward, the team wants to validate and improve their model by comparing their results with long-term in situ development measurements. Through this, they hope to offer helpful suggestions to those designing bank protection structures.